'Law should encourage citizens in their civil duty to "do the right thing" in a moral sense and not turn a blind eye or fail to act to help someone who is in need.' Consider to what extent the criminal law relating to commission reflects this view. Omission is when the defendant does nothing to prevent the victim's death. In certain circumstances, D may be under a duty to take positive steps to assist V, and if D fails to take those steps then he can be liable for murder or manslaughter. If D is liable for V's death, he must be under a duty to act in the circumstances, otherwise he will escape liability. This was shown in Khan and Khan, in this case D escaped liability as there was no imposition of duty of care. Duty of care can be owed in a variety of situations. One of these situations is when duty arises out of contractual liability; where failure to fulfil a contract is likely to endanger lives, the criminal law will impose a duty to act. ...read more. S and D were liable for manslaughter convictions as they had assumed a duty of care for V, and their feeble efforts to look after her amounted to gross negligence. Duty of care can also arise out of the creation of dangerous situation. Where D creates a dangerous situation then, on becoming aware of it, he is under a duty to take steps to prevent or minimise the harm. If he fails to take such steps then he will be criminally liable for the end result. This situation arose in Miller, here D was liable for the damaged caused as he took no steps to prevent the fire from spreading. The Good Samaritan law enforced in France states that if someone is seen in a dangerous situation, you must help them, unless the situation will jeopardize your own life. D can be released from a duty that had been voluntarily undertaken or had one imposed on him, this was shown in Smith, where V had stopped D from calling a doctor when she had given birth. ...read more. However there are some serious moral and practical objections to this view. One of the objections is that it is difficult to decide the definition of when it would be easy for D to attempt a rescue. Another objection is the forcing of citizens to watch out for and protect each other, even though citizens pay for highly trained professionals to do the job. Also D can misjudge the difficulty of the situation and can put himself at risk. The criminal law in France and USA encourages citizens to do the right thing by enforcing the Good Samaritan law. In the UK there is no such law and a person must only help another if there is imposition of a duty to care. 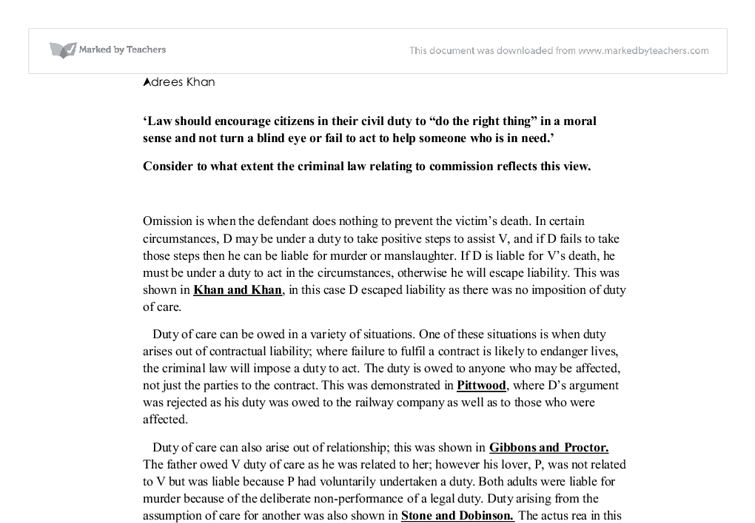 If there is no imposition of duty of care, then D is not required to help V, this was shown in Khan and Khan. However there is a reform suggested but it should not be enforced as citizens already pay tax to be protected from highly trained professionals. ?? ?? ?? ?? Adrees Khan ...read more. the ordinary conduct of daily life", thus incorporating a point of law from the common law into a statute. The offence of ABH has been clarified through case law, although there are still important issues that remain unresolved. He was allowed the defence as Lord Milmo said "it can amount to a lawful excuse for a threat to kill if the threat is made in the prevention of crime or for self-defence, provided it is reasonable in the circumstances to make such a threat". 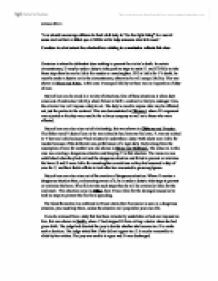 factual cause there is no reason to use further tests as it is only likely to increase the probability of allowing the defendant to be found not guilty, and therefore leaving a crime unpunished. This ruling was for policy reasons to protect those who are vulnerable. However, the major condemnation aimed at these three cases were that the prosecution had brought the wrong change and that they should have, instead, been charged with Deception offences. Those dangers include officers abusing their powers and harassing ethnic minorities based on stereotypical and personal prejudices that have been created and therefore, the balance between a suspects right and the police?s power is thrown into disarray as the police, if granted authority by the Home Secretary, hold significantly more power over the suspects during a time of danger. Secondly we look at whether force was used in order to steal. If the force was not used for the purpose of stealing then it will not be robbery. In the scenario the threat of force was used in order to get the money from the cashiers.